Social justice is the fuel that drives social workers and what sets social work apart from other professions. Social workers form the front line of assistance for their clients and make up the threads of society’s social safety net. The strength of that net, however, depends not just on the strengths of social workers, but also on the social policies that undergird their practice. 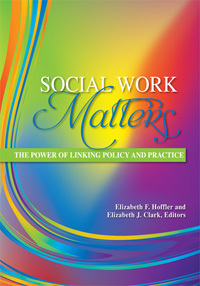 In Social Work Matters: The Power of Linking Policy and Practice, editors Elizabeth F. Hoffler, MSW, and Elizabeth J. Clark, PhD, ACSW, MPH, showcase expertise from across the profession to demonstrate how social work matters to the healthy functioning of society. The premise for Social Work Matters emerged, in part, from the breadth and depth of social work services. Each chapter portrays what different kinds of social workers do on a daily basis, and how that work affects and is affected by community life. In addition, more than 50 chapter authors link the direct practice side of social work with critical policy and advocacy components of the profession. The book as a whole explores the transition from micro-level service—working directly to improve the lives of individuals—to the macro-level work of altering our social systems and institutions through broad social action and advocacy.